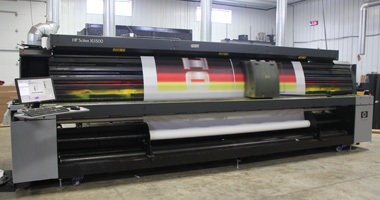 Celina Tent is a world leader in manufacturing fabric products and distributing event equipment. It's our mission to provide friendly customer service and quality products to an ever-expanding world. 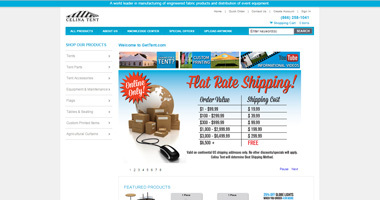 With primary sales driven by our 24/7 website, www.GetTent.com, we've been able to create informative and easy-to-use websites geared toward maximum customer satisfaction. The Celina Team is devoted to using state-of-the-art equipment, sourcing the highest quality materials, constantly improving our manufacturing methods and processes, and employing the best in motivated workers. Celina has established itself as a leader in tent and fabric product innovation, combining modern equipment and software to make the highest quality products while remaining competitive through economical engineering to ensure quick manufacturing and product delivery. The main manufacturing campus at Celina is an 8,350 square meter (89,000 square foot) facility housing engineering and sales offices in addition to cutting, printing, and manufacturing divisions. The main hub of our company, the main facility also houses our quality-assurance lab. As of 2017 Celina's primary storage and distribution will be moved to a new 9,030 square meter (97,200 square foot) Distribution Center, built adjacent to the main manufacturing campus. Previous warehousing was located in the nearby town of Coldwater, Ohio, having only 5,945 square meters (64,000 square feet) of storage space, which we've since outgrown. The Distribution Center is the workhorse of our whole operation, where high-demand items are kept stocked and ready for shipment. Our new facility with additional space and better organization is the support base for our standard lines of all-white event tent tops. The entire facility covers 4,406 square meters (50,000 square feet) of manufacturing space, bolstering our constant need for our products in the highest demand. Manufacturing: Innovative and efficient processes drive our ever-improving work flow, meeting the industrial fabric needs of commercial, industrial, governmental, and defense industries. 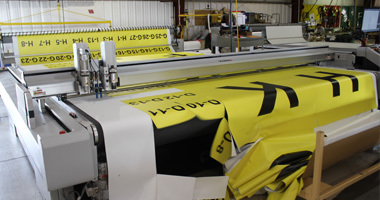 Printed Products: More specialized products, printed with custom or stock graphics to meet the needs of any situation, are a growing sector of the fabric product market.